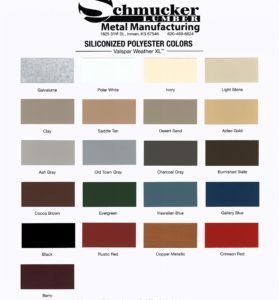 You can customize your building needs not only with color, but utilizing our state of the art computerized manufacturing facilities we can customize a wide variety of shapes, forms and many different trims & flashings manufactured to exact specifications. No building project is complete until the finishing touches are applied. Flashing and Trims have hems along the exposed edges for safety installation and a neater finished appearance. We use coil stock finished with Valspar Weather X Paint for longevity, endurance and performance.